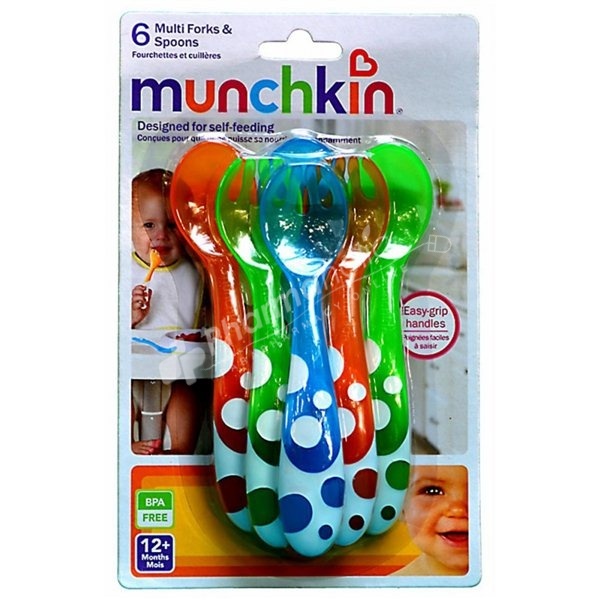 Munchkin Multi-Coloured Forks and Spoons are designed to aid self feeding, their curved handles make scooping food easier. Deep spoons hold more food, the curved forks are safe but designed to help the transition to cutlery. Pack of 3 forks and 3 spoons designed to aid self feeding. Curved handles designed to make scooping food easier. Deep spoons to hold more food and make scooping food easier. Curved forks are safe but designed to help transition to cutlery. Fun and engaging colours and design. Colours and assortments may vary. Wash and inspect before use. Top rack dishwasher safe.Do not microwave, boil or steam sterilize. Discard and replace at first sign of weakness or damage. Always check temperature before feeding. Do not let child walk or run while carrying the utensils. Do not leave child unattended . Discard all packaging components before giving to the child.